Credit: James Baldwin and Manuel Mundo-Ocampo, UC Riverside. 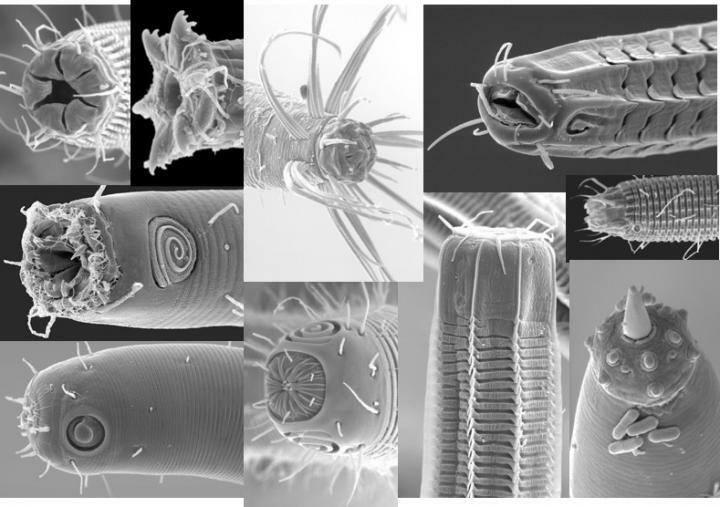 RIVERSIDE, Calif. (http://www.ucr.edu) — The ocean floors are literally crawling with nematode worms. A square meter of sediment can contain millions of worms from hundreds of species. In such tight quarters, how does everyone get enough to eat? University of California, Riverside researchers investigated whether microbiomes–microbial communities that are associated with larger hosts–might play a role. Since gut microbes help with food breakdown, perhaps different species have evolved different microbiomes to reduce competition and promote co-existence. It turns out that's not the case. As reported Friday in Molecular Ecology, the likelihood that nematodes have similar microbial profiles does not correlate with how closely they are related. Holly Bik, an assistant professor in UCR's Department of Nematology, led the study. Although there has been little research on the microbiomes of invertebrates, Bik's findings differ from previous studies in other nematode species (including those raised in laboratory conditions) and insects, where particular microbial profiles appear to cluster within families. The turtle ant, for example, survives on a diet of hard-to-digest food that is low in nutrients. Without its unique gut microbiome, which helps in the breakdown of inaccessible nutrients, the ants would have to compete with other species for more readily available food sources. Bik's team examined 281 individual worms from 33 genera that were collected from off the coasts of Southern California, the Gulf of Mexico and the Arctic. The team meticulously isolated individual worms, which they first characterized under a microscope (nematodes have traditionally been classified into four "feeding groups" based on their mouthparts) and then by DNA analysis. The DNA analysis provided a genetic snapshot of individual nematodes' microbiomes, including bacteria, protists, fungi, and other microscopic organisms. The microbes associated with each nematode could provide information on the gut microbiome, parasites, or partially digested food that is representative of each species. They found that there was no relationship between how closely nematodes were related–or how similar they looked–and their microbial profiles. There was also no correlation in the microbiomes of nematodes isolated from the same geographic areas. "Our results suggest that in marine habitats, free-living nematodes may utilize more diverse and generalist foraging strategies than previously thought," Bik said. Bik said an unexpected and interesting finding was the previously undiscovered association between nematodes and several parasites, including slime molds that have been reported as parasites of other marine invertebrates. Another finding was the frequent association between nematodes and bacteria that play important roles in nutrient cycling, an essential ecological process for life on Earth. "Nematodes may play a significant but unacknowledged role in the global nutrient cycling of carbon, nitrogen, methane and sulfur," Bik said. The title of the paper is "Nematode-associated Microbial Taxa Do Not Correlate With Host Phylogeny, Geographic Region or Feeding Morphology in Marine Sediment Habitats." Taruna Schuelke, a bioinformatics specialist, and Tiago Pereira, a postdoctoral researcher, both in Bik's lab, were joint first authors. Sarah Hardy from the University of Alaska, Fairbanks, also contributed to this research.